Disease possibly contracted from deer mouse feces in Yosemite National Park. 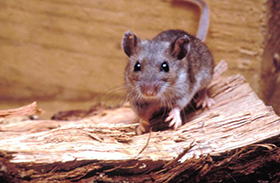 A deer mouse, primary carrier of Hantavirus in the United States. Image courtesy of the Centers for Disease Control and Prevention. FRESNO, Calif. – A California tourist has died after contracting hantavirus pulmonary syndrome, a rare disease carried by rodents, the Associated Press reports. The disease could be linked to a popular lodging area in Yosemite National Park. The man stayed at Curry Village in June, and officials have reported that a woman who also stayed in a canvas tent cabin about 100 feet from him on overlapping days has become seriously ill, according to the AP. The virus was found in the feces of deer mice in the lodging area of the cabins, according to tests by the Centers for Disease Control and Prevention and state health officials. The deer mouse is the primary reservoir for the virus in the United States; rodents shed the virus in their urine, droppings and saliva, and it is primarily transmitted to humans when they breathe air contaminated with the virus, according to the CDC. “There’s no way to tell for sure, but state health officials feel (the victims) may have contracted it here in Curry Village,” Scott Gediman, a park spokesman, told the AP. The man, who was from Alameda County in the San Francisco Bay area, would be the first person to die from the disease contracted in the park, though two others were stricken in a more remote area in 2000 and 2010, officials told the AP. Read more on this story at ABC News.